Volcanoes aren't living beings, so they aren't chaotic or anything. So long as you build them in a neat and orderly fashion I won't mind too much. Please don't edit and discuss and then change it again so much, it is very hard to see your actual moves. Hope i got everything right this turn. It is nice that you come up with so many ideas of terrain or flora/fauna, but i will have to categorize them, else i will run out of colors soon. Thats why i put the kelp forrest into category underwater, while i put the jungle into tropical, which is the same color i gave asks for his tropical islands. hope that is ok. it has to be paintable after all. As far as i can see you didn't use up all points from Dlover, so he got 1 left. - the goddess of the sea creates a lagoon with a nice beach on the north of the southwestern continent. She also adds some suboceanic life in front of it. - the god of the silver flame raises a long line of mountains along the see, starting from his mountain. He also lets more gras grow in the center of the continent. - Jhaz only creates a little mountain path, then he offers his power to the other gods. - the god of food gifts some more islands with tropical life. - the god of mysteries creates a large area of jungle life on the southeastern continent. First things first: Jhaz begins flipping his S*** off the handle about the edges of this world beginning to unravel. It is not an ordered process! In order (Mind the pun) to solve this, he proposes everything be transferred to a new universe, specifically this one. SPOILERS: Yes, I've taken note of L&S's Clash of the Pantheons, but haven't looked into it. All I know is it's not this. 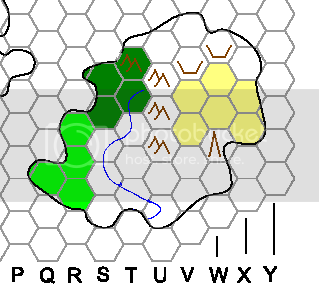 I create 4 hexes of river in a lovely fertile valley (aluvial plain, IIRC, prime farm land!). On the map, you see 6 hexes of river, please start my 4 at the ocean and work backwards toward the mountains. Since I care about the direction of the river even within hexes, I am posting a picture. In my attached picture you will also see my plans for the future. Please ignore them unless a player wants to help out. So I rolled an 8 for this turn. I use all 12 of my points for this turn, and I should get a bonus of 3 next turn. Nerre, sorry to be a pain by not posting pictures previously, but my jungle is off in your pictures. The S colum is 1 too low, and the T column is 2 too low. I double checked the coordinates I typed last turn. My picture shows what I intended, and what I think I typed. I will tell you when it is done, top priority atm has my game Curse of the Gold. Everyone has been doing a good job of getting under 5 points. Luckly those +3 a turn is helping speed things along. Finally feels like the world is getting a bit of shape. Was going to do jungle at S16 since it's kinda close to the center of the world but nah I like forests more. side note, turns out I dislike the way I did the history. I'll redo it and make it better latter. No worries - to be honest all we need is the latest map + Taberah's history and we can just pick up on the new forum. No need to take everything if it's not required.